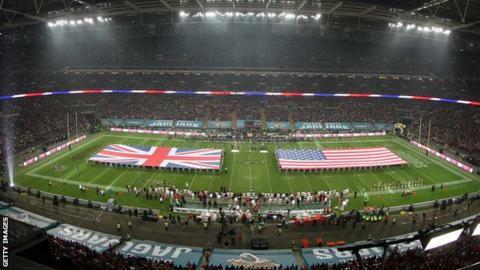 NFL Wembley: Seven years until London Jaguars? Rams? Raiders? Tottenham fan Mark Waller is desperate to get his team into Wembley Stadium, but not just as a temporary home while the builders are in. An Englishman in the National Football League's New York headquarters, Waller will have failed as the league's head of international expansion if he has not got an American football team sharing the national stadium with the England football team by 2021. Waller - born in Kenya, Welsh mum, English dad, school in Wales, university in England, "career all over the place" - was speaking in a hotel about 20 minutes' drive from Wembley, 48 hours before the NFL stages its ninth game there since 2007, when Oakland Raiders take on Miami Dolphins on Sunday. Every single one of those "International Series" games has sold out - bar Chicago's win over Tampa in 2011 when tickets went on sale late because of the NFL lock-out and the attendance was 76,981. And having coyly dipped a toe in the water with one game a season for six years, the league tried two last year, before climbing in up to the thighs with three this season. A quarter of million tickets have been sold for this year's games, with more than 33,000 people buying a mini-season ticket for all three. Nine out of 10 tickets have been bought by people who live within three hours' travel of London. Whether all of those will remain in British hands is debatable: StubHub, the online ticket exchange, says sales for Sunday's game are up nearly 20% on the equivalent game last year. But when you factor in this week's announcement that Sky Sports has agreed to show five NFL games a week from next season, plus the improving viewing figures and participation rates, you start to wonder 'why wait seven years?'. "To permanently relocate an NFL team to the UK is a massive," said Waller, not sounding remotely like somebody who thought it was too massive. "It's not like putting a team in a US city. There are a whole set of logistical implications for the players, coaches, back-office staff and so on. "There are also implications for the rest of the league and issues for the stadium. "We play at Wembley, England play at Wembley, so it's important for both of us that the surface holds up. So we need to test playing games over consecutive weekends, followed by an England game. "And, at the moment, we give any team that comes over here the following weekend off. That is not going to be practical in the future, so we will have to look at a team playing here one week, and then back in the US a week later. "So there is a lot still to be done, because any team we put here has to be competitive. It's not just about putting a team in the marketplace, that team has to be able to win the Super Bowl." It is often all too easy to get swept along by an expert salesman's patter (and I say that with genuine respect, Waller is also the NFL's chief marketing officer) but it is important to remember just how remarkable a statement that is. It was only 16 years ago that London's last professional gridiron team folded. Gates had slumped to 6,000, although by that stage the Monarchs had been forced into a nomadic existence, each new home less regal than the last. Ten years ago, the UK's last professional gridiron team, the Scottish Claymores, fell on its sword, too. Like dizzy teenagers, it seemed the British public had picked up American football in the 1980s and decided it was the coolest thing in the planet, only to get bored and put it down again. But that is the thing about fashion - wait long enough and it comes around again. This time, however, the NFL is determined to reach "timeless classic" status. Which timeless classic, though? The London Chargers? Jaguars? Rams? Raiders? All four of those franchises - currently in San Diego, Jacksonville, St Louis and Oakland respectively - are on short-term leases with their existing homes, and two of those, the Jaguars and Rams, are owned by men who already own London sports "franchises", Fulham owner Shahid Khan, and Arsenal's Stan Kroenke. But that is getting ahead of ourselves slightly, particularly as the NFL's bigger priority must surely be re-establishing a team in the second biggest city in the US, Los Angeles. Either way, Waller was not going to give the game away. "In both markets we have focused on laying the groundwork - the stadium, the fans, the logistics," he explained. "We [at NFL HQ] have spent very little time thinking about the teams, and who goes where. That is for our owners to decide." That said, Waller acknowledged it was "clearly a help" that some NFL owners know the British market and "media environment" better than others. And to that number you can add Manchester United's proprietors, the Glazers. Talk of them, and "soccer" in general, got me wondering if the NFL's charm offensive was a response to the sight and sound of Premier League tanks on their Astroturf. America's favourite league - and it still is, despite a truly horrible run of self-inflicted bad press - is also the world's most profitable, with annual revenues about double the Premier League's. But the gap is closing, and our football is catching on with them, too. Waller, who as well as supporting Spurs, counts cricket and rugby among his favourite sports, denies the NFL is responding to any perceived threat from the Premier League. "Not at all," he assured me. "We started [the International Series] before the Premier League gained its current momentum. "I don't like comparing sports, but our average audience for a live game on Sky is the same as a Premier League game on NBC." Could the NFL's razzle dazzle find a regular home in the London drizzle? This might be true in terms of share (actual Premier League audiences in the US are about four times the size of NFL games here), but our game has certainly done better in terms of extracting money from US networks than the NFL has so far here. "Yes, it would be fair to say we're in investment mode," said Waller. "But it is hardly a loss-leader." It is worth noting that Waller's boss, Roger Goodell, made his feelings on the matter clear last year. "We've got passionate fans in the UK," said Goodell, who wants to more than double the league's revenues by 2027. "Our ownership understands that this is a market we need to be more active in." So, enough of us seem to want it, the NFL's accountants would love it, and if the University of Hawaii's players can travel 2,500 miles and cross four time zones to play college games, surely the NFL's well-remunerated professionals can make it work, too. Over to you, agent Waller. Do the NFL's problems start in college? Read more on Do the NFL's problems start in college - or earlier?